Travel from the spectacular City of Dreams, Mumbai, to the splendid city of Bangkok. Get exciting air fares on Mumbai to Bangkok flights, only with us. Check out flight schedules, compare flight timings and shortest travel distance only with our Mumbai to Bangkok flights. You could opt for Vietnam Airlines, Etihad Airways, Korean Air Lines, Garuda Indonesia, All Nippon Airways, Sunstate Airlines, Jet Airways, Singapore Airlines, Virgin Australia, and Fiji Airways while booking your Mumbai to Singapore flight tickets. A total of 114 flights function between Singapore and Mumbai every week. One-way Mumbai to Singapore flight tickets is considerably cheaper than round trip ones. The time difference between Mumbai and Singapore is 2 hours and 30 minutes. Akbar Travels offers you the widest choice of airlines for Mumbai to Singapore flights. So you can choose your most preferred day, time and number of stops for your flight. So why wait? Search and get the cheapest Mumbai to Goa Singapore flight tickets only on www.akbartravels.com. 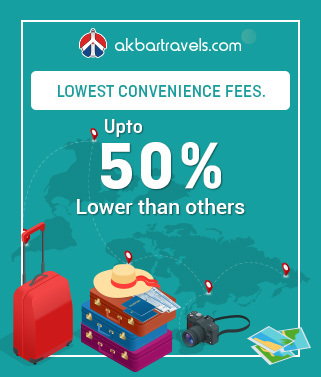 Find the best deals on Mumbai to Singapore flight tickets on www.akbartravels.com and book your flights at the lowest airfare along with benefits like instant confirmation, airfare calendar, easy cancellation/refund and lowest convenience fee. he city also has a primary rainforest in the City Centre, 300 parks and 4 nature reserves, and plenty of green spaces to escape the hustle and bustle of the city. With an abundance of world-class, affordable attractions, old school jungle huts, chic cocktail bars and everything in-between, Singapore caters to everybody, from budget backpackers to high rolling billionaires! Where else in the world could you marvel at the gems of the historic Chinatown, tuck into a delightful curry in Little India, before ending the night on the top of the iconic Marina Bay Sands sipping a cocktail? 1. Which month has the lowest airfare for Mumbai to Bangkok flights? The cheapest month to that the lowest airfare for the Mumbai to Bangkok flights is March. 2. Which is the best month for the Mumbai to Bangkok flights? April is the best month to visit Bangkok as the Thai New Year is celebrated with traditional customs in this month. 3. How far is the city centre from Suvarnabhumi airport? Suvarnabhumi Airport is connected to the city center through metro, express buses, and taxis. 5. What is the currency of Thailand? What is the conversion rate? The currency used here is Thai Baht (THB). 1 Thai Baht is valued at 1.92 Indian Rupees. 6. What is the time difference between India and Thailand? There is a time difference of 1 hour and 30 minutes between India and Thailand. 1. What are the airline brands that offer Mumbai to Bangkok flights? A:The airline brands that offer Mumbai to Bangkok flights include Spicejet, Thai Airways, Singapore Airlines, Jet Airways, Indigo, Air India, Bangkok Airways, Malindo Air, Fly Dubai, Malaysia Airlines and Cathy Pacific. 2. How many weekly Mumbai to Bangkok flights are there? A:There are 245 weekly Mumbai to Bangkok flights. 3. Which is the earliest Mumbai to Bangkok flight? 4. What time does the last Mumbai to Bangkok flight? 5. What are the airport codes of Mumbai and Bangkok? A:The airport code of Mumbai is BOM and Bangkok is BKK respectively. A:The name of the international airport in Mumbai isnamed as Chhatrapati Shivaji International Airport. It was formerly called as Sahara International Airport. 7. What is the name of the airport in Bangkok? Strange Laws: There are several strange laws in Bangkok. For one, leaving the house without underwear can lend you in jail. It is also illegal to drive a vehicle bare-chested. It is also against the law to step on Thai currency. City of Millionaires: Thailand is home to around 200,000 millionaires. 95% of them live in Bangkok. Largest Gold Buddha: Housed inside Wat Traimit in Chinatown is the largest gold Buddha statue in the world at a height of 9.8 ft tall and weighs around 5.5 tons with an estimated value of 250 million dollars.